Here you will find the answers to frequently asked questions about our picture hanging systems. How do I install a STAS rail? On which wall types can I install a STAS rail? Can I install the rail on a plaster wall? At what distance from the ceiling should I install the rail? Can I cut the rail to size? Can I paint the rail? If so, which type of paint and pretreatment are necessary? Can I mount the rail in or on a corner? Can the rail be hung diagonally? How many meters of rail do I need? How can I remove the rail again? Is the rail suitable for paintings only or could I also hang a whiteboard, clock or mirror? Which hooks and cords should I pick? Can I hang multiple pictures from one cord or cable? Can I cut the perlon cord or steel cable? How wide is the steel cable? How wide is the perlon cord? How long does a steel cable last? How long does a perlon cord last? What is the weight capacity of a zipper and a smartspring? The STAS smartspring is creating tiny cracks in the cord, how is that possible? How can I make sure the hooks are not visible above the painting? How do I prevent a painting from tilting forward when hung? I want to move the STAS cobra to another place in the rail. Can I just pull the cord to the left or right? How to install the STAS picture hanging system? How to use the STAS drilling template? How to shorten a STAS rail? How to connect STAS rails in a corner? How to remove the STAS picture hanging system? 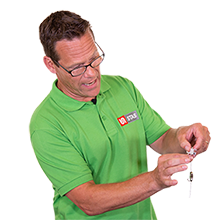 Installation videos can be found on the product pages for the different rail types. Or view all installation instructions here. STAS rails can be installed on almost all wall types. On concrete and brick walls, the rail can be installed with the provided plugs. On timber walls, the rail can be installed just with the screws. On plaster walls, the rail can be installed with special plugs for plaster walls. Installation on glass is not possible. Mark the wall on both ends with a small dot about one inch from the ceiling. We recommend using a chalk line between these two dots (requires 2 persons). If your wall and ceiling are completely smooth, flat and level, it is also possible to use a wooden strip of about two inches wide. Simply hold it to the ceiling and mark a short line underneath along the wall at every 10 to 16 inches. The brass clips / clip screws and fasteners can now be installed on this line. When the rail is mounted, the pencil marks will no longer be visible. Note: when installing STAS j-rail, STAS j-rail max, STAS multirail crown or STAS multirail flat, it is also necessary to mark the drilling spots on the chalk line, since the holes have been pre-punched into the rail. For ceilings that are completely smooth and even, we recommend drilling at 0.75 – 1 inch below the ceiling. For textured (popcorn) ceilings or uneven ceilings, we recommend drilling at about 2 inches below the ceiling. Also keep in mind that the drill leaves marks on the ceiling if you are drilling too close to it (this is a common mistake). You can download a handy drilling template here to help you install your picture hanging system at the correct height. Yes, the rail can be easily cut to size using a hacksaw. Remove any burrs after sawing (to avoid scratching the rail lacquer). Caution: when sawing one of the STAS multirail systems, it is vital you use the included wooden strip to keep the copper wires in place. Can I paint the rail? If so: which type of paint do I need and which pretreatment is necessary? Yes, the rail is paintable. Gently sand down the rail with very fine sandpaper and make sure the rail is clean, dust free and greaseproof. Next, paint the rail with acrylic paint. Yes, two rail segments can be connected in or on a corner with the help of corner connectors (aka combicaps). These are available in our webshop. Can the rail be installed diagonally? No, the rail must always be installed horizontally. How many metres of rail do I need? For optimal flexibility and the sleekest look, we recommend installing rail across the full length of your walls. The rail can be easily cut to size. The best way to remove the rail from its clips, is to use a screwdriver. Wrap a piece of cloth around the screwdriver to prevent damage to the rail. Place the screwdriver at the bottom of one end of the rail, between the rail and the wall. Now carefully move the screwdriver upwards, pulling the rail loose from its installation clips. Once you have made a start, you can gently loosen the rail by hand. Our hanging systems will accommodate many diverse objects like whiteboards, clocks, mirrors, quilts, seasonal decoration and any other object that is flat enough, has proper hanging hardware and doesn’t exceed the maximum load capacity. So feel free to get creative! This depends on the type of rail you have chosen, the weight you wish to hang from the rail and the look you prefer. The perlon cord is transparent and therefore hardly visible. The steel cable (also available in black and white) is suitable for hanging heavier decorations and has a more industrial look. Several combinations can be made per rail type. Rails in the STAS j-rail series use different hooks and cords. Yes, you can. You can use multiple STAS smartsprings or STAS zippers on a single cord or cable. Just make sure the maximum allowed weight of the cord is not exceeded. Also keep the maximum weight capacity of the selected rail system in mind. Basically, the perlon cord can be cut. However, this may cause problems: the use of unsuitable scissors may create a burr, making it difficult to slide the picture hook onto the cord. We recommend rolling up the overflowing piece of cord and tucking it away behind your artwork (if necessary, use an elastic band, some tape or a paperclip). Steel cable cannot be shortened. The steel cable is 1.8 mm wide. The perlon cord is 2 mm wide. The steel cables have a limitless life span. We recommend replacing a perlon cord every five years due to exposure to climatological influences. A smartspring on perlon cord can carry up to 4 kg. A zipper on perlon cord can carry up to 15 kg. A zipper on steel cable can carry up to 20 kg. Combining a smartspring with a steel cable is not possible. This is caused by the self-locking mechanism of the smartspring. The hook latches onto the perlon cord for grip. These surface cracks do not influence the quality or the load capacity of the cord. This differs per type of painting, depending on where the hanging hardware is situated at the back. Is your painting hung from steel wire hardware? If so, make sure the steel wire isn’t too long. The painting will also tilt forward if this is the case. The use of a sawtooth hanger can be a very good solution in all cases. If your painting is tilting forward, you may want to check the hardware at the back of it. Chances are the wire is too long or attached too low. No, we emphasize that the STAS cobra is specifically designed to hook into the rail at any desired location. If the cord is pulled too hard under a certain angle, there is a chance that the STAS cobra will be bent. This is due to incorrect use of the system and STAS is in that case not responsible for consequential damage.